Previously blog post under Virupaksha Trail I shared details about a brief history Hampi and Virupaksha Trail. In this post I will share my experience with Vitthalapura Walk, which was organised whilst, I stayed at the Evolve Back Resorts in Hampi. I just love the way, Evolve Back Resorts Hampi, have split the site seeing into four trails, for you to pick from or go for all, still giving you some time to unwind and enjoy the scenic beauty of the resort. Day 2 had me wake up fairly early, after breakfast, the Vitthalapura Walk had been set up. Bhanu was the guide once again. Driving through the city was quite the bit of fun. There was livestock all around, walking freely. What fascinated me were the pigs running and walking along. I got of the car to follow a little pig, only to get chased by its mother. I ran with class! So getting back to my journey. We stopped by the ancient gateway, an entry from one of the forts in the city. I had to get some good pictures. Up next we arrived at the entrance of Vittala Temple (Vittala is considered another form of Lord Vishnu). Here we decided to head straight for the temple, and took the mini carts that are available, you have the option to walk. However, it was too warm outside to do so. So I took the easy way out. Always love the easy way out! Once we arrive at the temple, the resemblance to the entry of the temple is like the Virupaksha temple. 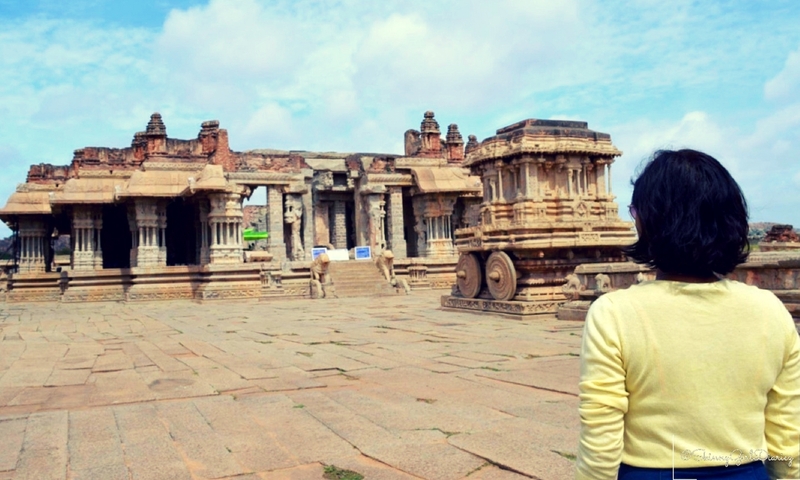 Vittala Temple is a magnificent work of art and showcases some of the finest craftsmanship. The floor of the pathway has depictions of worshipers laying down before the gods as a form of respect. This is found throughout the entry on the stairs. The entire temple is held within a compounded wall, and is a campus with temples, pavilions and halls inside. The main attraction and the most iconic is the Stone Chariot. Around the temple premises the old town of Vittalapura remains in ruins. The entire halls and pillars have carvings of various sculptures. Legend has it that the “Stone Chariot” is a shrine that was built in the form of a chariot and used by Lord Vittala who is another form of Lord Vishnu. The shrine contained Lord Garuda (Lord of Eagles) inside it, this is empty now. The wheels used to rotate till a few years ago, now they have been blocked from to prevent any further damage. Facing the Stone Chariot is the Maha Mantapa which has open halls. This mantapa is known as the musical pillars. The pillars were made in such a dynamic way, that if one tapped it would emit musical sounds. In the past these were used to entertain the kings and dancers would perform in the arena. Apparently, the sound from these pillars was heard across the city. The pillars are damaged now, and no one is allowed to tap to help preserve these structures. Again one is left at awe of the amazing architecture. The insides, even the ceiling has been carved in the form of a lotus. On the east side is the musicians hall, known more so for the sculptures of musicians and dancers craved on the pillars. The south side of the hall, has got Yalis, are mythical creatures. Whereas, the north side of it has pillars with Narasimha carved on it. To the west is just a closed hall with open porches on both side. Another highlight of this work of art is the pillars, had holes in them, where rain water when it trickles through would make an enchanting rhythm. I could not get a closer look, but one of the stones had a four creature carving on it, a frog, monkey, snake and a lion on it. Next, we walk out of the temple and head to another place that holds importance. Puskarni is a temple tank and was used more for ritual baths. During the monsoon the tank fills up. As we returned back to our car walking, there are plenty of structures still being excavated. All that walking I needed to quench my thirst. I love sugarcane juice, I decided to make some(kids do not try this at home). The juice never tasted any sweeter! That was just a couple of hours but felt like i spend hours there. The heat was a bit too much. Best times to go is October to February. The weather is much better. So with half day completed, it was time to head back to the lovely Evolve Back Resort to freshen up and grab some lip-smacking lunch and gear up for the Raya trail. The Vitthala Temple is awesome! I love your pictures, Deena!